VANGUARD CLASS NUCLEAR SUBMARINE - identity unknown, inward bound to HMNB Clyde 30/04/2018 photographed passing Rhu Narrows. Perhaps another member can identify her. Hi Jim, brings back memories perhaps. Range: Only limited by food and maintenance requirements. Kelvin Hughes Type 1007 I-band navigation radar. Marconi/Ferranti Type 2046 towed array sonar. Type 2043 hull-mounted active and passive search sonar. Type 2082 passive intercept and ranging sonar. Pilkington Optronics CK51 search periscope. Pilkington Optronics CH91 attack periscope. Two SSE Mk10 launchers for Type 2066 and Type 2071 torpedo decoys. RESM Racal UAP passive intercept. The Vanguard-class is a class of nuclear-powered ballistic missile submarines (SSBN) in service with the Royal Navy. Each submarine is armed with up to 16 Trident II missiles. The class was introduced in 1994 as part of the UK government's Trident nuclear weapons programme. 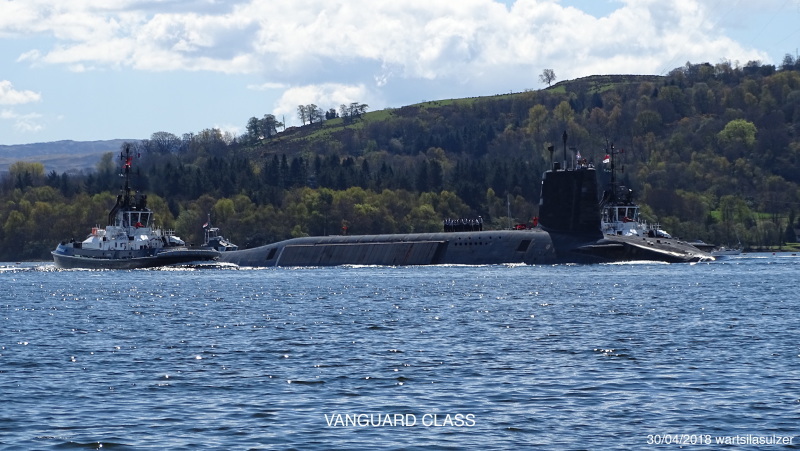 The class includes four submarines: Vanguard, Victorious, Vigilant and Vengeance. They were built at Barrow-in-Furness by Vickers Shipbuilding and Engineering between 1986 and 1999. All four submarines are based at HM Naval Base Clyde (HMS Neptune), 40 km (25 mi) west of Glasgow, Scotland. Since the decommissioning of the Royal Air Force WE.177 free-fall nuclear bombs in 1998, the four Vanguard submarines are the sole platforms for the United Kingdom's nuclear weapons. Since the late 1960s, the UK had operated four Resolution class submarines armed with US-built Polaris missiles under the terms of the 1963 Polaris Sales Agreement. On 10 July 1980, Prime Minister Margaret Thatcher wrote to US President Carter to request the supply of Trident I (C4) missiles on a similar basis for the United Kingdom's next generation ballistic missile submarines. However in 1982 Thatcher wrote to US President Reagan to request the UK be allowed to procure the improved Trident II (D5) system, which had been accelerated by the US Navy. This was agreed in March 1982. Under the agreement, the United Kingdom made a 5% research and development contribution. Lady Thatcher laid the keel of the first submarine, HMS Vanguard, on 3 September 1986. 1992 saw a debate over whether the fourth vessel should be cancelled, however the Ministry of Defence ultimately ordered it in July 1992. Hydrogen bombs, or thermonuclear bombs, are more powerful than atomic or "fission" bombs. The difference between thermonuclear bombs and fission bombs begins at the atomic level. Fission bombs, like those used to devastate the Japanese cities of Nagasaki and Hiroshima during World War II, work by splitting the nucleus of an atom. When the neutrons, or neutral particles, of the atom's nucleus split, some hit the nuclei of nearby atoms, splitting them, too. The result is a very explosive chain reaction. The bombs dropped on Hiroshima and Nagasaki exploded with the yield of 15 kilotons and 20 kilotons of TNT, respectively, according to the Union of Concerned Scientists. In contrast, the first test of a thermonuclear weapon, or hydrogen bomb, in the United States in November 1952 yielded an explosion on the order of 10,000 kilotons of TNT. Thermonuclear bombs start with the same fission reaction that powers atomic bombs — but the majority of the uranium or plutonium in atomic bombs actually goes unused. In a thermonuclear bomb, an additional step means that more of the bomb's explosive power becomes available. First, an igniting explosion compresses a sphere of plutonium-239, the material that will then undergo fission. Inside this pit of plutonium-239 is a chamber of hydrogen gas. The high temperatures and pressures created by the plutonium-239 fission cause the hydrogen atoms to fuse. This fusion process releases neutrons, which feed back into the plutonium-239, splitting more atoms and boosting the fission chain reaction. This photo has been shown 1,155 times since it was added to the site.